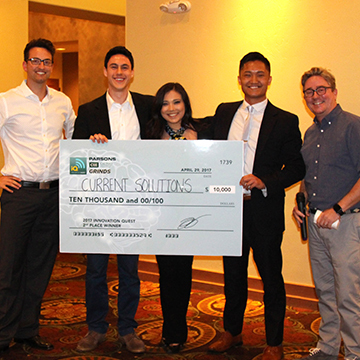 Cal Poly startups took the top four spots at the annual Center for Innovation and Entrepreneurship (CIE) Innovation Quest (iQ) competition. 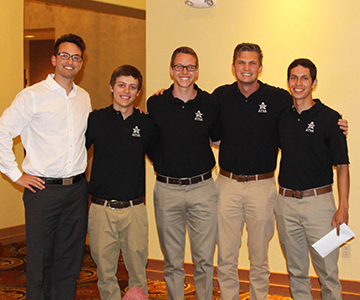 All top four teams included students from the Orfalea College of Business. iQ empowers and supports innovators and entrepreneurs to build interdisciplinary teams to go from ideas to prototypes to companies. iQ is designed to encourage innovators to pursue their ideas and help with the funding needed to launch their business. This is an opportunity for entrepreneurial-minded students to showcase what they’ve built, coded, designed or prototyped throughout their efforts at Cal Poly. Founded in 2003 by Cal Poly graduates and business leaders, Carson Chen (Electrical Engineering, ’73), Richard Boberg (Electrical Engineering, ’70), and Laura Pickering (Electrical Engineering, ’84), iQ has already awarded more than $300,000 in support of Cal Poly innovators and entrepreneurs who have used the program as a platform to launch successful businesses. Startup teams applied for iQ in winter quarter, and finalist selection and presentations took place in spring. 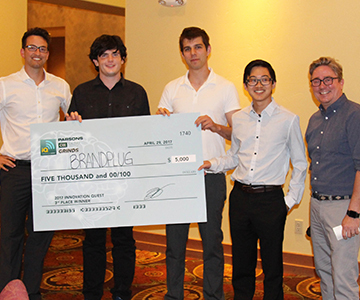 Parsons, a technology-driven engineering services firm based in Pasadena, Calif., has sponsored iQ for four years by providing thousands of dollars in prize money and enabling industry veterans to serve as judges for the final presentations. 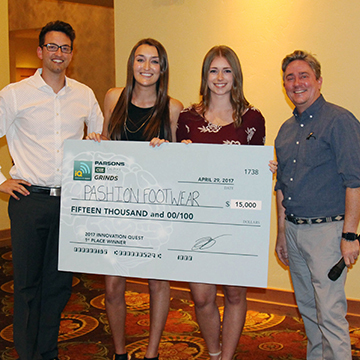 Pashion Footwear is an innovative fashion startup working to create a “practical and fashionable” approach to the classic stiletto heel – an adaptable shoe that can fully convert from a pump into a sandal. Current Solutions brings users and their loved ones peace of mind and enhanced safety. Its app and stun-gun enabled cell phone case harnesses the power of community for when you find yourself in unsafe or emergency situations, even if it’s just when you’re walking to your car after work. Brandplug allows marketers to lower their social media celebrity marketing costs by more than 50 percemt by using our novel pay-per-impression social media celebrity-marketing platform. Atsá Foods LLC is an innovative foods company that incorporates Native American super foods into everyday snacks.